Slichot the week before Rosh HaShanah is the Hebrew Calendar/Jewish Year equivalent to Moses' week-long daily rehearsal of assembling and disassembling the Mishkan prior to erecting and inaugurating it on Rosh Chodesh Nissan. These parallel "weeks" on both sides of the Jewish Year prepares us for receiving G*d's presence, both externally and internally. 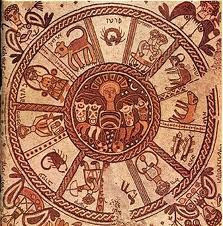 Jewish Astrology teaches us that this is one of the most difficult weeks of the Jewish Year - the transition from the last (waning) Quarter Moon of Elul through the New Moon and then Rosh HaShanah - the only one of the 12 Hebrew Months whose Molad (time of "birth") we don't announce publicly in Shul the Shabbat prior to arrival. 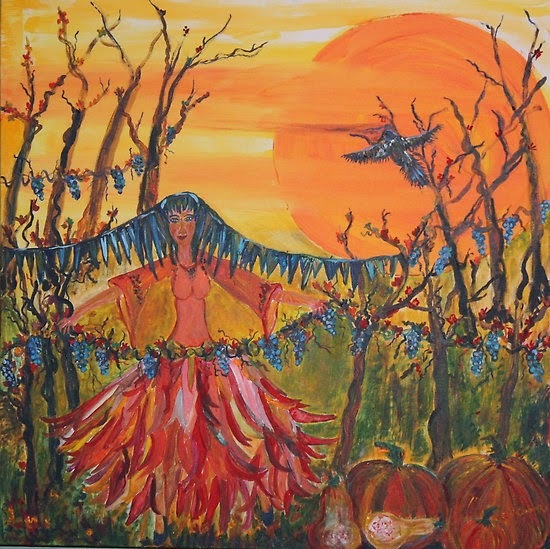 This week also contains the sharp turn of the Seasonal Year at the Autumnal Equinox, just prior to the New Moon. This week is one of vulnerability in the realm of physical health due to the change of seasons/change of energy/Elul's association with the Sign of Virgo and the "Healing Arts", mind/body connection. Most vulnerable are those who have not taken advantage of Elul's cleansing properties and made transformative adjustments in the realm of their emotions and thoughts. It's not too late. Don't give up - but guard your energy levels, your health, in particular your immune system. Personally, I believe sound has the power to heal. Hence the importance of Slichot - particularly this week. 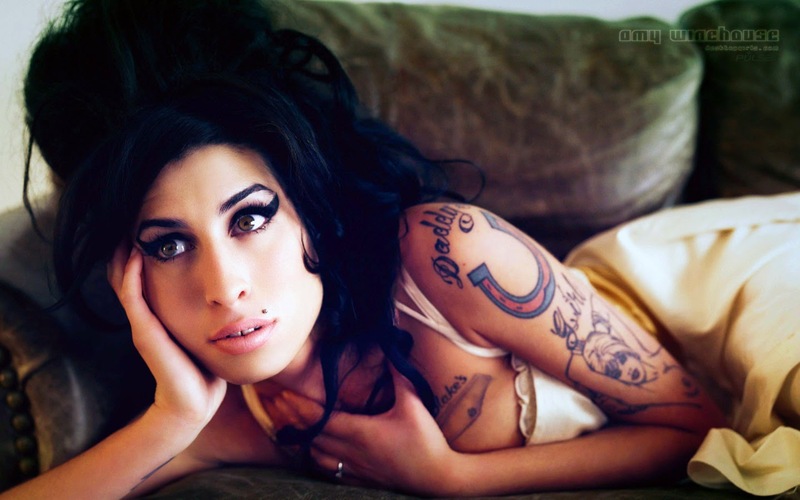 September 14th would have been Amy Winehouse's 31st Birthday, had she not tragically died at age 27. Thinking about the loss of her talent, her troubling, vulnerable presence and the "what if she had lived" scenario one often imagines of those who seem to have left the Earth before their time led me to take a look at her Natal Chart for further insight. 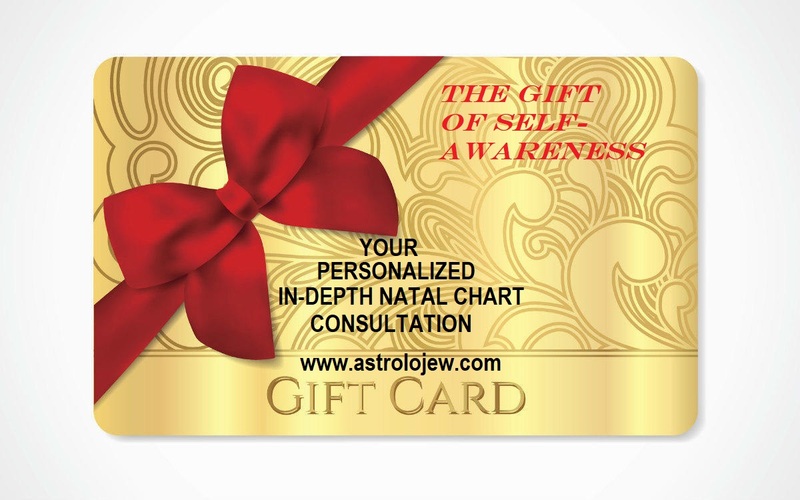 Amy's Natal Chart is remarkable for being a series of Conjunctions. A Conjunction is where two or more Planets are within 5 degrees of each other, causing a greater influence/melding of the two Planetary energies and giving the combined force of the two Planets emphasized power and importance. We will see these various Conjunctions by Planet/Asteroid, Sign and House as we watch the story of her Chart unfold. The Mutable, malleable, changeable, communicative Planet Mercury dominates the Natal Chart of singer/songwriter/performing artist Amy Winehouse. Mercury, associated with both Gemini and Virgo, is the Ruler of Amy’s Virgo Sun, which happens to be Conjunct her Natal Planet Mercury in Virgo as well as being the Planetary ruler of her Gemini Ascendant. Because the Planet associated with one’s Ascendant (“Rising Sign”) is said to be the “Ruling Planet of the Chart,” Mercury is by this standard as well as its predominance (Combust Conjunction) the most dominant influence of her chart. The Archetype of Mercury is that of the “Winged Messenger,” quick intelligence, mental activity, thought process, all communicative skills from speech to singing to oration, etc. The Hebrew name for Mercury is “Kochav” which means simply “Star”, as the closest and brightest Planet to the Sun, only fast-moving Mercury is quick enough to stay away from the Sun’s potentially destructive heat while remaining visible and “reliably changeable” to the naked eyes. Gemini and Virgo are both “Mutable” Signs, they transform the elements they are associated with. Gemini is Mutable Air, which is transformative thought. Virgo is Mutable Earth, which is transformative manifestation. Amy’s natural talent was expressed through her voice, and her vocation as a singer/songwriter. As she thought, so she sang. As she imagined herself to be, so she expressed herself through her compositions, her voice, her dress, her makeup and hair, her stage persona. Amy was born to be a "Star" and she knew it from birth. Not only were her communicative powers subtle, unique, varied and multifaceted, but they were ingrained in her from her 4th House Family of Origin, where her Mars (her "koach," energy, Chi, drive, "Yetzer") and her Venus (creativity, art, music, dance, beauty, romance, the aesthetic perception) are Conjunct together in Leo. Amy’s Venus and Mars Conjunction in Leo in her 4th House made her the performer/actor/drama queen - not only in her family of origin, but in her professional life as well, which grew out of her "amateur" life at home. Mars at 20 Leo and Venus at 23 Leo give her a powerful dramatic flair that is easily evident with only a cursory glance at pictures of her throughout her career. Located in her 4th House of Home, Family and "The Seat of the Soul", this dramatic flair clearly sprung from her family of origin, perhaps going back several generations. Amy may have known that “showing off” was the most effective way of getting attention in her family. Her retro style of glamour was also very Leo-like and seems to have originated in some kind of ancestral connection to her family of origin as well (a beautiful, dramatic, artistic and creative female relative). Her home life growing up may have been a competitive environment where the loudest and most dramatic contestant "won" (the prize being the attention/affirmation from the intellectual/detached/distant/professional parent. Neptune, the Planet of glamor, illusion/delusion and distortion (both romantic and other) at 26 Sagittarius forms a harmonious Trine (150 Degree Angle) to her Mars/Venus Conjunction, giving her that “touch of magic” which allowed the Fire Sign energy of Charismatic Inspiration to smolder, burn and blaze at her will. Her North Node at 20 Gemini is Conjunct her Ascendant at 17 Gemini. Nearby (at 23 Gemini, also in her 1st House of Personality/Ego Manifestation and “Self” awareness) is the Asteroid Vesta, which is the archetype for the goddess of hearth and home. It is interesting to note that Amy Winehouse’s North Node (the “Karmic Setpoint” and “Tikkun Point” of the Chart) and her Asteroid Vesta are Conjunct each other and her Ascendant. Her Karmic imperative (North Node in 1st House) was towards individuation, becoming fully herself via her own unique individuality, as opposed to via relationships with others (South Node in 7th House). Her Vesta burned very bright, adding its steady flame to her North Node, but in a curious way making her even more removed from her ability to directly FEEL her own emotions. The immense influence of Mercury in her Chart erected a barrier between her experiences and her ability to feel. Everything was filtered through the lens of thought, and the only way she could bypass that was to step into her performance persona (Mars/Venus Conjunct in Leo), becoming someone else – the Amy Winehouse character she invented. Amy’s Moon at Zero Degrees Capricorn in her 7th House tells a sad story. It is said that a Planet is not established in a Sign until it reaches 1 Degree. Amy’s Moon, so important to her chart, is “disabled” because it falls at Zero Degrees (not yet established in the Sign) of Capricorn, a relatively lonely and isolated place for the emotional Moon. Her Moon Placement at Zero Capricorn in her 7th House of Relationships created an eternal cycle of frustration in the area of romance and emotional connection. Neptune at 26 Degrees Sagittarius in her 7th House informed her marriage and romantic partnership choices with stunning idealism which easily could be manipulated into outrageous levels of denial of reality and a knee-jerk reactionary response to criticism of her choice in mates. She frequently mistook sexual/romantic drama for love. 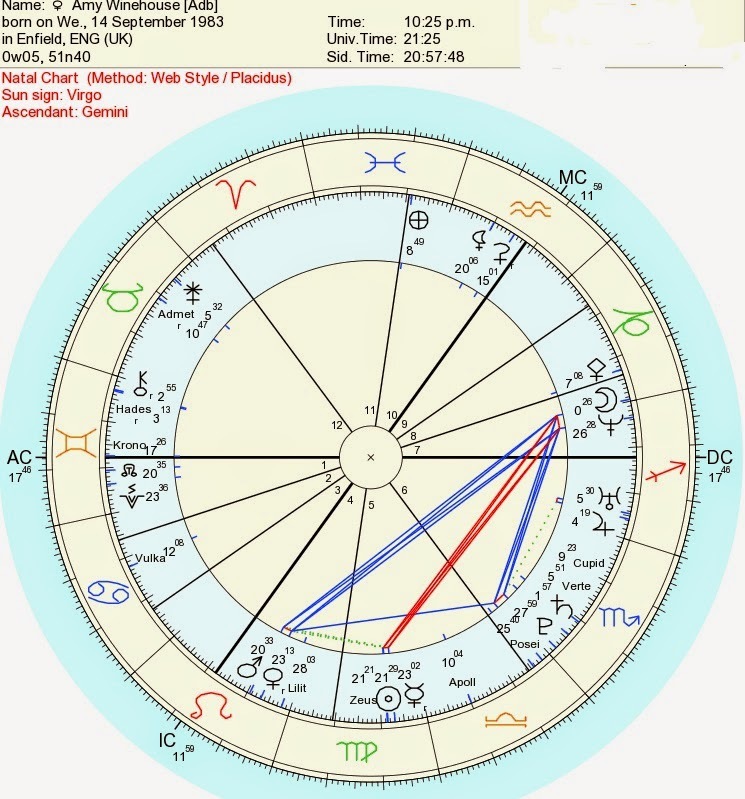 Her Mars/Venus Conjunction in Leo fell in her 4th House of family and home, the “seat of her soul”, where and how she grew up in her nuclear family. Very likely Amy the show-off performer perceived herself as the glue that held her parents marriage together. Emotional drama, perhaps even emotional violence, colored her perceptions of love and informed her relationship style. Unable to truly emotionally connect with her disabled Zero Degrees Capricorn 7th House Moon, she used her Mars/Venus in Leo as the vehicle for connection, but because her family of origin paradigm taught her that artificiality (the performance persona) was key to receiving the affection she craved, and because her mutable, transformative, mercurial Virgo/Gemini attributes made becoming another person than herself so easy, she couldn’t really trust being “herself” with another in intimacy. A disconnect between body and mind is illustrated in her 6th House. The Sign of Scorpio is “incepted” in her 6th House (meaning the entire 30 Degrees of Scorpio is contained within the House itself, which begins at 24 Libra and ends at 17 Sagittarius). Saturn at 1 Degree Scorpio in her 6th House of physical health, mind-body connection and the healing arts Conjunct her Vertex at 5 Scorpio is a configuration with a double-edged sword. Her natural capacity for immense concentration, determination and focus in her body-mind connection (Saturn, Planet of structure, control, boundaries) was “incepted” or energetically confined/trapped in her 6th House. The Vertex is the “rabbit’s hole” of the Natal Chart. Like Alice in Wonderland who chased after the White Rabbit until she fell down the rabbit’s hole into Wonderland, the Vertex shows where in our life we fall down our own personal “Rabbit’s hole”, where we make repetitive mistakes, or always take the wrong turn. In Amy Winehouse’s chart, patterns of extreme control over her body/mind connection were consistently interrupted by total loss of control, destructive excesses, the mistaking of intensity for validity, the romanticizing of excess and addiction, and the conviction that the next mistake would be the last. “Lucky” Jupiter in his home sign of Sagittarius Conjunct individualistic, unique Uranus in Sagittarius, both in her 6th House, gave her a “Lucky Charm” outlook on excesses and deliberately intense infliction of physical/emotional “Chaos vs. Control”. She always thought she’d come out on top, knew she had a “lucky streak” but was arrogant in playing her “luck” card, never knowing how many punch-holes it had left until the last one. Her family of origin dynamic had a big influence on her outlook. Desiring to please an emotionally unavailable, detached parent, she became a performer. Her home life and her perception of her parents’ marital dynamic was a curious mix of intellectual curiosity and camaraderie with undertones of sexual jealousy and rivalry for attention. She could please them by being smart and relating to them on an idealistic, theoretical level, but could get attention from them (good or bad attention, it matters not which) by enacting her drama which caused them to give her the nurturing she so desperately needed – as long as she was perceived by them as “in trouble”. Her 10th House (Career and Vocation) Parts of Fortune (material blessings) in Pisces made her a victim of her own success. Knowing that it was through her own efforts that material abundance would enter her family of origin, she martyred herself (Pisces-like) and subsumed her own hesitations and even her own self-preservation instinct to carry on in her public persona / performance self because, if she stopped, she felt those who depended on her success would suffer. Saddest of all, the Asteroid Hades (literally one’s own private “hell”) is found Conjunct the Asteroid Chiron (“The Wounded Healer”) in Amy’s 12th House – the House that has to do with endings, secrets, subconscious and unconscious impulses, ancestral legacy, institutions, confinement, and the general falling apart of all things as they dissolve back into the primordial chaos that is the soup of Creation, only to be re-assembled and brought back to one-ness in the 1st House. Chiron, the “Wounded Healer,” is the illustration of one’s own primal wound. The only way to find relief from this wound is to help others heal their own similar woundedness, hence the “Wounded Healer” archetype. Amy’s “Wounded Healer” was Conjunct her own “private hell” in her 12th House. If she had lived and developed her own unique attributes, she might have had the capacity to become an incredibly skilled and sensitive counselor, therapist or facilitator, working with women whose sense of self built around artifice, illusion and disconnection from their own truth caused them emotional and physical damage. Eating disorders, dysfunctional relationships, the creation of a false persona, the mistaking of drama for love, the need to emotionally connect being stunted by an emotionally detached, distant or disengaged parent, the impetus to unique individuation hijacked by the inner voice of a punishing perfectionism, and an immensely genuine, authentic and gigantic talent to communicate through words, music and the language of costuming that outsized all the rest of it, and might have carried her above and beyond the impedances of her mundane reality if she hadn’t overestimated her luck and underestimated the destructive properties of drugs, alcohol and those substances, behaviors and people she used to manage the emotional pain of meaning so much to so many people and so little to herself. Happy Birthday, Amy Winehouse. I still miss you - all of you, the "real" you and the "unreal" you, your multifaceted selves hadn't even really begun to unfold yet before you were taken from us too early. You would have grown up into a grand old dame! The Full Moon during the Month of Elul (Virgo) always falls in Pisces. Opposite this in the Hebrew Calendar is the Full Moon of Adar (Pisces) which always falls in Virgo- that's PURIM. We're on the opposite end of Purim with this coming Full "Harvest" Moon on Monday, September 8th. The Pisces Sun/Virgo Full Moon of Purim energizes us to "Ad Lo Yodeah," to go beyond what we "know" into the unknown, the realm of pure faith, which is a mystery (Purim's "Esther" is from the root which means "hidden" or "mystery"). Opposite that - The Virgo Sun/Pisces Full Moon of Elul energizes us to "Yodeah," to KNOW, to use the sifting, the analytic discernment of Virgo as a launching pad for the Full Moon in Pisces, the most emotionally open, porous, unbounded,unconditionally accepting Moon of the entire 12-Moon Cycle of the Hebrew Calendar. We "Harvest" this Full Moon what we was sown during the Full Moon of Purim,, half a year ago. What was sown in mystery will be reaped in revelation. What we planted in the dark, moist soil of our souls now stands tall and ripe, ready to be harvested so that it may nourish us. We don't just reap what we sow, we consume and absorb it. The consequences of our thoughts, words and actions become either our nutrients or our poisons. May we harvest a good crop!